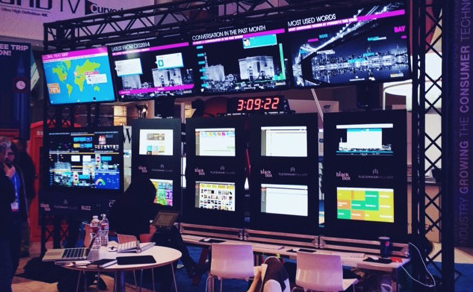 AUSTIN, TX: FleishmanHillard's goal at South by Southwest this year is to make big data interactive for attendees through its mobile social media command center called the "Black Box Lounge." The Black Box, which will go live on March 7, will allow Fleishman to capture big data through social media and make it manageable, as well as defining trends and insights, and then use that information to guide a content-creation strategy, said SVP and partner Steve Bauer. He added that the Black Box will showcase Fleishman's key services and offerings, such as social listening, insights and strategy, content development, community management, digital Web design, influencer engagement, and paid digital amplification. While the Black Box was part of Fleishman's efforts at SXSW last year, Bauer said it will focus on "making big data interactive" this year by including touch screens that allow attendees to digest and engage the information. With a team of 30 staffers, including creatives, producers, writers, and designers, attending the festival from March 7-11, Fleishman will listen to conversations and develop content based on popular topics. It will include everything from videos and photos to articles and infographics, said Bauer. The lounge will be open to all badge-holders, but Fleishman is also inviting a handful of influencers to a personalized experience where they can view topics, trends, and conversations going on in the social space about themselves or their brands. In addition to producing an "end of South by Southwest recap report" to share with clients and other interested parties, Fleishman will post content on its social channels and on the microsite BlackBox.FleishmanHillard.com. The agency will use the hashtag #FHblackbox throughout the festival. Fleishman clients AT&T and Chevrolet will also attend the event, and Bauer said the firm has several cross-promotional activities planned, including AT&T's GigaPower service promoting the Black Box. The team will also track conversations about Chevrolet and AT&T on the social media command center.